Our Sportive tours are travel packages for those riding the Etape du Tour and Haute Route Ventoux. These tours are designed to make sure you don’t have anything to worry about during your time with us other than riding your event. Accommodation, transfers and meals are included. New for 2019 is our Cycling Camp, made for those who’d like to get in some early training in sunny Spain (Costa Daurada). The camp is competitively priced and based in a popular resort, a few kilometers from some outstanding, hilly riding. The 2019 Etape du Tour starts in Albertville and finishes at the highest ski resort in Europe – Val Thorens. The event will replicate Stage 20 of the Tour de France, the de facto last day of the Tour de France. Part of a growing line of high-quality cycling events, Haute Route Ventoux is a 3-stage race (open to all) that is based in our backyard! Like the Etape package above, as soon as you arrive in Provence, we will be taking care of you – all you need to do is ride. 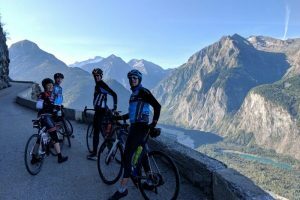 For riders who want to jump start their training, this early-April cycling camp offers 4 days of fantastic riding along the Costa Daurada, south of Barcelona. The camp is reasonably priced and all inclusive once you arrive.